Soledad Salamé, whose works range from monumental museum installations to 16-inch photos etched into aluminum, now has a more extensive presence on the gallery web site. 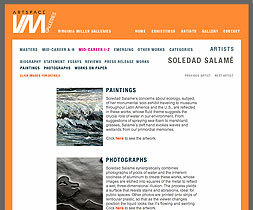 Along with three-part section of Salamé’s works divided into Paintings, Photographs and Works on Paper, there also are essays on the artist’s solar sculptures by the Venezuelan art historian Bélgica Rodriguez and on her series “The Labyrinth of Time,” by K. Mitchell Snow, a writer and critic based in Miami, Florida. Amplifying those are two recent reviews by K. Mitchell Snow and Edward J. Sullivan, Professor of Fine Arts at New York University’s Institute of Fine Arts.